Founder of Fleischmann Yeast Co.
Charles Fleischmann was a 19th century food manufacturer. He co-founded the Fleischmann Yeast Company in Cincinnati, Ohio. 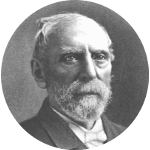 His company produced the first commercially available yeast in the United States which allowed the mass production of bread. The village of Fleischmanns, New York, is named for Charles Fleischmann. Located in the Catskill Mountains, the village was originally named Griffin Corners until Charles Fleischmann built a summer mansion there. He entertained there frequently bringing his guests in by private rail car. Soon after the area became a popular retreat for the wealthy and the village's name was changed to Fleischmanns. In 2008, Charles Fleischmann was inducted into the American Society of Baking's Baking Hall of Fame. Charles Fleischmann is the 3rd great-grandfather of Theranos founder Elizabeth Holmes.